At right, Catherine Best, a research professor of bioengineering, supervises students, including REU participant Javier de Jesus Astacio, center, who is studying mechanical engineering at the University of Puerto Rico, Mayaguez, and Yujin Lee, an Illinois junior in bioengineering. This summer, 10 undergraduate students performed research using advanced imaging and microscopy technologies through the Discoveries in Bioimaging Research Experience for Undergraduates. Funded by the National Science Foundation, the 10-week program also allowed the students to experience life as a graduate student and provided critical professional development. 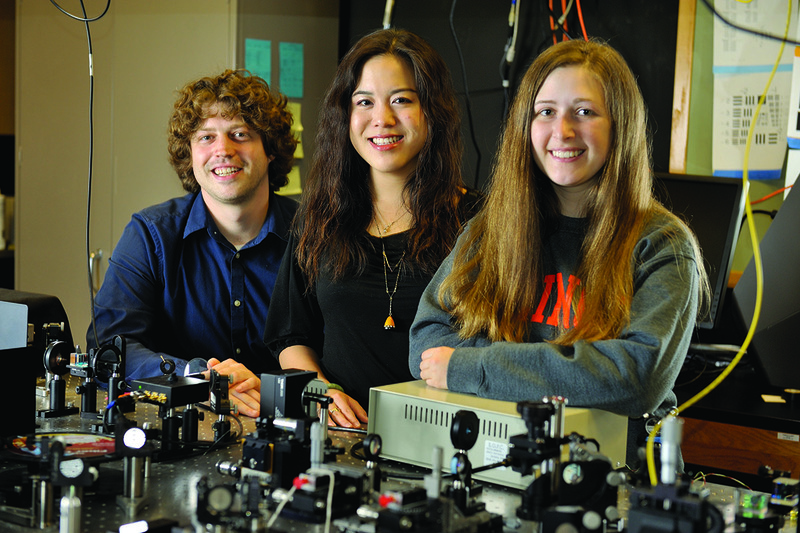 “Our REU program is a wonderful opportunity to bring in some of the top undergraduate students in the U.S. and inspire them through bioimaging to pursue graduate degrees,” said Stephen Boppart, a professor of electrical and computer engineering and of bioengineering who also is co-chair of the Integrative Imaging theme at the Beckman Institute for Advanced Science and Technology. Boppart is the principal investigator for the program. “This is the perfect opportunity to engage the next generation of scientists and engineers, particularly those from underrepresented groups,” he said. 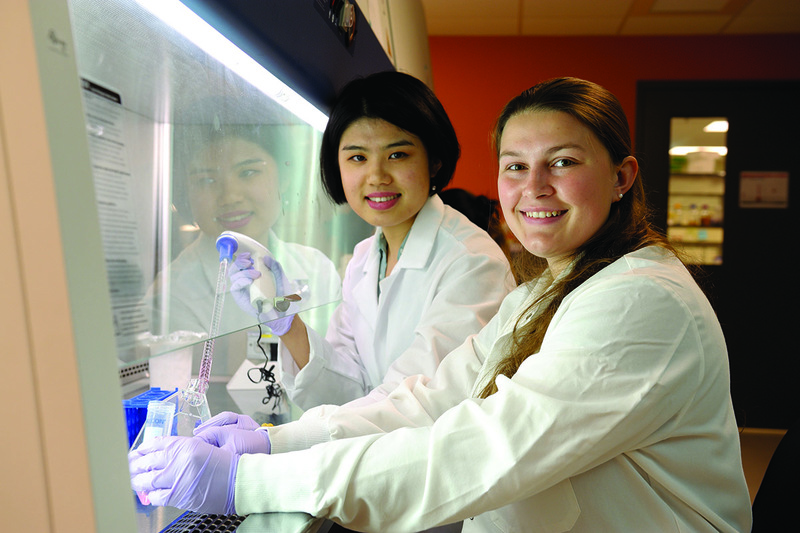 During the 10-week Research Experience for Undergraduates, Cheri Fang, left, a Ph.D. student in bioengineering, served as a graduate student mentor for Amanda Craine, a junior in biomedical engineering at Pennsylvania State University. The program begins with a weeklong Bioimaging Bootcamp that covers safety as well as basic information on biology, imaging and microscopy through lectures, lab demonstrations and tours. The students then engage in intensive research projects in imaging and biological visualization, under the supervision of faculty and graduate student mentors. Craine, whose research focused on studying angiogenesis, the growth of new blood vessels from pre-existing vasculature, worked in the lab of Princess Imoukhuede, a professor of bioengineering and member of Beckman’s Bioimaging Science and Technology Group. Than Huynh - the only Illinois student in the group - is a junior in bioengineering. He worked in the lab of Wawrzyniec Dobrucki, a professor of bioengineering and member of Beckman’s BST Group. Huynh previously worked with Dobrucki and his graduate mentor Jamila Hedhli, a Ph.D. student in bioengineering, who also was an REU mentor last year. His research project utilizes PET-CT, ultrasound technology and laser speckle contrast imaging to assess angiogenesis and its connection to the phenotype of different melanoma cell morphologies. Javier De Jesus Astacio, a student of mechanical engineering at the University of Puerto Rico, Mayaguez, worked in the lab of Catherine Best, a research professor of bioengineering. 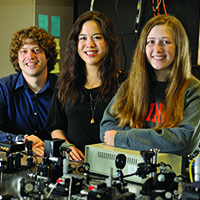 From left, Andrew Bower, a Ph.D. student in electrical and computer engineering, and Joanne Li, a Ph.D. student in bioengineering, mentored Janet Sorrells, a senior studying biomedical engineering at the University of Rochester. 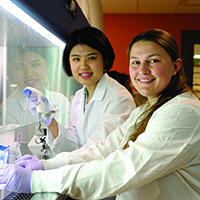 Joanne Li, a Ph.D. student in bioengineering, has served as the REU’s research team leader for three years and also was a graduate mentor for Janet Sorrells, who is working in Boppart’s lab. Sorrells is studying biomedical engineering at the University of Rochester. As the research team leader, Li checks in with each student frequently, holding weekly meetings with them to make sure they are making progress, meeting deadlines and handling the stress. “One of the purposes of this program is to let the students experience grad school at the U. of I., so I share a lot of my experiences with the students - both good and bad - because I want them to have a clear and realistic idea of what grad school is like and whether it’s the path they want to take,” Li said. It is expected the REU, which is in its final year of a three-year agreement, will be renewed. Andrew Smith, a professor of bioengineering and co-PI for the program, will serve as PI, and Marina Marjanovic, the REU program coordinator and the associate director of the GSK Center for Optical Molecular Imaging, will serve as co-PI. Boppart will continue as a faculty mentor. Of the 12 students who have graduated since participating in the program during the first two years, nine are in graduate school or will enter this fall. Five are enrolled or planning to attend Illinois.